A painter, printmaker and draughtsman, Jacob Isaacksz. van Ruisdael trained in the family circle with his father Isaack, who was a painter and frame-maker, and with his uncle, the landscape painter Salomon van Ruysdael. Unlike his father and his uncle, Ruisdael changed the “y” in his surname for “i”, a formula that he used throughout his life to sign his paintings. Jacob was a precocious artist and his first works date from 1646 while he was still a teenager. Two years later his name is registered in the guild of Saint Luke in Haarlem. Around 1650 he travelled with his friend the painter Nicolaes Berchem to Westphalia. During that trip they saw the castle of Bentheim, which inspired a series of paintings by Jacob in which the castle is seen from different viewpoints. He also visited the castle at Steinfurt during this journey and painted it several times. Approximately thirty etchings are known from this period. Around 1656 Jacob van Ruisdael is documented in Amsterdam, where he became a citizen three years later, and during these years his work became increasingly complex. Winter landscapes, scenes of waterfalls, windmills and marine views (the latter revealing the influence of Jan de Porcellis and Simon de Vlieger) all appear in his repertoire at this date. It has been suggested that some of his landscapes include hidden symbolism relating to the waterfalls and windmills, among other elements. 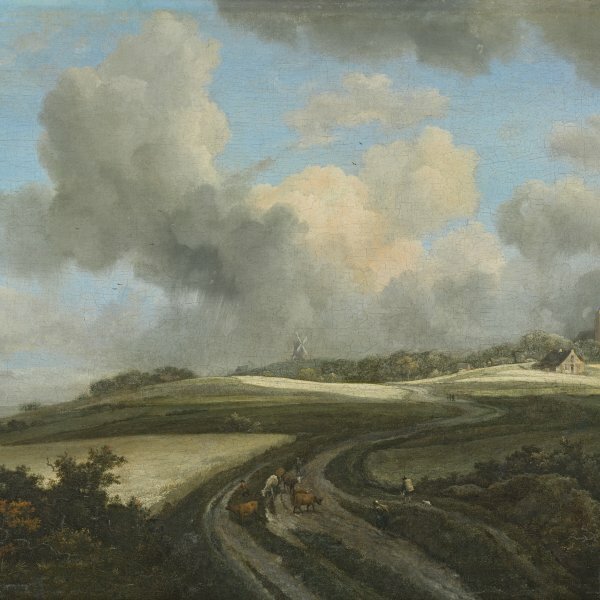 The Jewish Cemetery (Detroit Institute of Arts), The Castle of Bentheim (National Gallery of Ireland, Dublin), and numerous views of cities such as those of Haarlem can all be considered among Ruisdael’s finest works. Nicolaes Berchem, Philips Wouwerman, Adriaen van de Velde and Johannes Lingelbach painted the secondary figures in Ruisdael’s landscapes. In addition, he collaborated with Thomas de Keyser in the execution of the landscape in the monumental portrait of The Family of the Burgomaster of Amsterdam (National Gallery of Ireland, Dublin). His most talented pupil was Meindert Hobbema, while followers and imitators include Salomonsz. Ruysdael, Cornelius Decker, Adriaen Verboom and Roelof de Vries.